9 Hole City League plays on Thursday evenings. We play Thursdays for about sixteen weeks from late April to mid-September. Tee times are 4:30 to about 5:00, convenient for many golfers' work schedules. Unlike some other leagues, you don't need to sign up with a partner or team. You'll be playing your matches against individual opponents of similar ability. You'll receive your tee times and pairings in advance for the entire season. Golfers of all skill levels are welcome. Men 18 and older are eligible. If you don't want to commit to the full schedule, you can still join as a substitute and just play whenever you can. 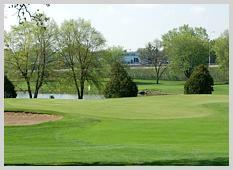 The 9 Hole City League is part of the Greenhaven Men's Club, and you must be a Men's Club member to join the league. Men's Club membership is currently $90 per year. As a Men's Club member you can also participate in the many other events and tournaments that are offered, not just league. Once you are a Men's Club member the additional cost to join the 9 Hole league is just $25. Virtually all the league entry fees are returned to members as prize money at the end of the season. You are also welcome to join us as a substitute. You'll be contacted by other members who have scheduling conflicts to invite you to play a match on their behalf. Subs are always in demand, so if you'd like you can probably play almost every week. Even if you aren't subbing for another member, you are welcome to just show up on Thursdays and play along with another group for fun. Becoming a sub is a great way to try out the league without a long-term commitment, meet the members and determine if joining as a full member next season is right for you. As a sub you do not pay the $25 league fee, but must still be a Men's Club member. If playing a full round is more your style, there is also an 18 Hole City League that plays Thursday afternoons.